Delhi’s real estate story continued its paradoxical trajectory, with prices remaining stubbornly high despite towering unsold inventory. The country’s capital witnessed a fall of two percent in the average value of apartments in Apr-Jun 2016 vis-à-vis Jan-Mar 2016, with only one-sixth of the tracked localities posting a price rise. 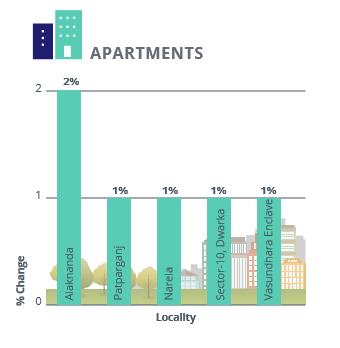 Prices of apartments in all the zones were dismal in Q2 2016. While Dwarka, West and South Delhi saw values plummeting by 2-3 percent, each, the eastern and northern zones witnessed a minimal dip of one percent, each. The otherwise insignificant North Delhi locality of Narela recorded an uptrend due to the increase in floor area ratio (FAR) from 1.5-2 to 3 along the metro corridor. This locality will also boast of the largest waste-to-energy plant in Delhi NCR soon. Entailing comparatively lesser expenses, builder floors enjoy higher popularity than society apartments in Delhi, thus recording a stable market in Apr-Jun 2016, as compared to the previous quarter. 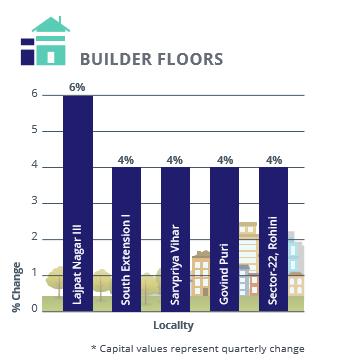 More than half of the tracked localities in South Delhi witnessed an average increase of three percent in capital rates of builder floors, with Lajpat Nagar III, South Extension I and Sarvpriya Vihar clocking the highest growth of 4-6 per cent, each, Y-o-Y. Housing market in Lajpat Nagar III grew on the back of infrastructure overhaul, in addition to becoming a major metro interchange hub for commuters in the Faridabad-Kashmere Gate and Majlis Park-Shiv Vihar corridors. 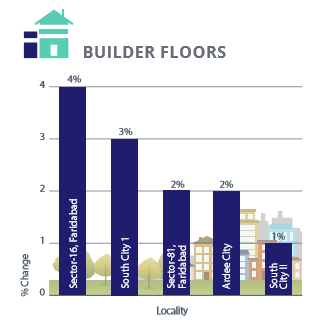 Average value of builder floors in North Delhi grew by two percent, with Rohini Sector-22 being the frontrunner. Although a bird’s eye view reveals a lacklustre rental market, certain parts of Delhi – Dwarka and West Delhi posted decent growth of three percent and two percent, respectively, Y-o-Y. 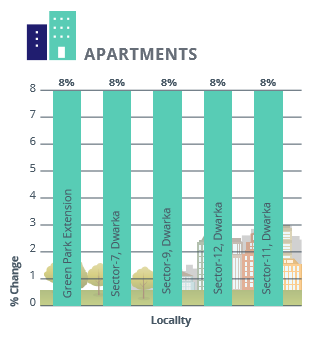 Rents of apartments in Dwarka remained robust, with sectors 7,9, 10,11 and 12 witnessing a yearly surge of eight percent, each. High rate of office space absorption, combined with seamless connectivity with Gurgaon via the Dwarka Expressway and comparative affordability, fuelled rental growth in Dwarka sub-city. Paschim Vihar in West Delhi clocked a rental surge of six percent on grounds of recent social and physical infrastructure development. On the contrary, the landscapes of North and East Delhi remained under pressure, with rentals dipping by 4-6 percent, each. 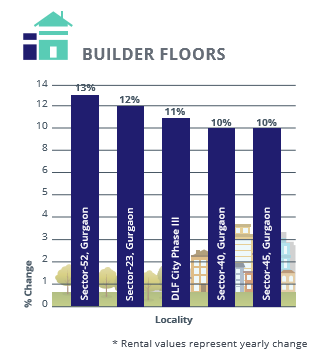 Replicating last quarter’s performance, rental values of builder floors in South Delhi remained stable as a result of high reputation index. 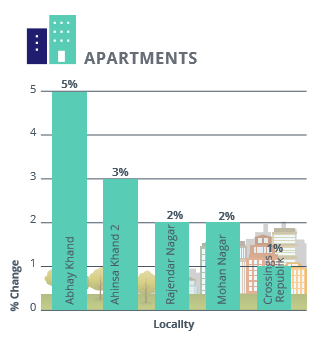 New Friends Colony, Defence Colony, C R Park, Malviya Nagar and Greater Kailash II, all belonging to South Delhi, topped the rental charts of Delhi with a jump of 4-5 percent, each, in values over the last one year. Not surprisingly, rates in Dwarka increased by two percent Y-o-Y, riding the wave of infrastructure development. Meanwhile, rental values in East Delhi inched up by a percent. On the contrary, rental values in North and West Delhi plummeted by 3-5 percent in Apr-Jun 2016, as compared to the same quarter in 2015. With supply exceeding demand, established clusters such as Model Town, Rajouri Garden and Tilak Nagar, witnessed a dip in rents. Soaring inventory, stalled infrastructure projects, and frequent legal tussles faced by developers in Noida and Greater Noida continued hurting market sentiments. These factors ensured a stagnant capital graph in Apr-Jun 2016, vis-à-vis Jan-Mar 2016. Nevertheless, certain pockets recorded a slight increase in enquiries, indicating a revival in the forthcoming quarters. Only one-fifth of the tracked localities in Noida recorded an increase in property prices, amongst which Sector 82 held the baton of progress with four percent rise in values. Noida Sector 82 scored over others due to the proposed 6.2-km elevated Dadri-Surajpur-Chhalera (DSC) Road, which would boost connectivity in the developing residential area of Sector 100. 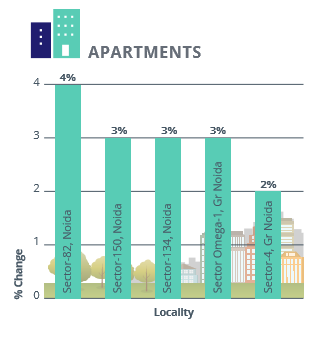 Average apartment values in Greater Noida fell by two percent Q-o-Q. Land values in Greater Noida followed the overall market trends to record no capital appreciation in the last one year. Prices of residential plots in Noida stagnated in Apr-Jun 2016, as compared to the same quarter in 2015, despite a spike of 14.19 percent in residential land allotment rate. Noticeably, property enquiries for land parcels have seen some growth in H1 2016. 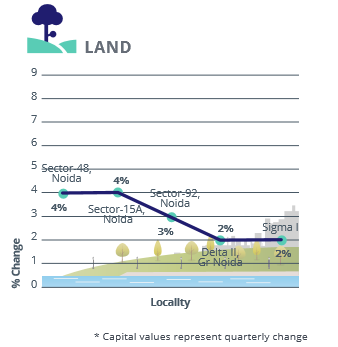 In Greater Noida, Delta II and Sigma I held the ground with two percent rise, each, Q-o-Q. These two housing belts are anticipated to enjoy improved connectivity by 2017 as a result of the expansion of the metro network to Pari Chowk and Delta I. The three percent rise in residential land values in Sector 92, Noida, is an exception. The recent hike in allotment rate could have contributed to this growth. The rental market in Noida succumbed to the pressure of soaring supply and limited demand and recorded no change in average ‘ask’ in the last one year. Both Noida and Greater Noida witnessed rents of apartments either plateauing or dipping Y-o-Y in 75 percent of the established sectors. Rental sentiments in Pari Chowk bolstered by an enormous margin of 10 percent on account of the proposed metro station in the locality. While well-developed physical and social infrastructure have always worked in favour of sectors 34 and 37, a 6-9 percent yearly rise in rentals in Apr-Jun 2016 as against the last year can be credited to the proposed metro link in Sector 34, in order to connect Noida with NH-24. Unlike the last quarter, builders floors in Noida performed well in Q2 2016, clocking an average rental growth of four percent. 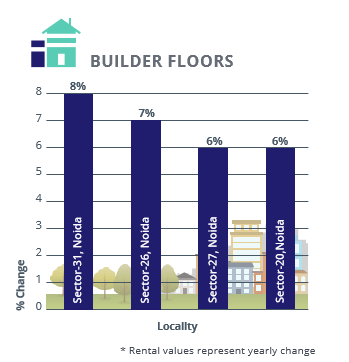 While rental rates in 60 percent of the tracked localities witnessed decent growth, sectors 20, 26, 27 and 31 saw values surging by 6-8 percent, each. Not only are all these sectors strategically located within a radius of 5-km from metro stations in Sector 18 and Botanical Garden, shopping centres and medical care units; some of these localities are also witnessing redevelopment of old properties. The development of Wave business centre can also be seen as a harbinger of positivity in the rental landscape. 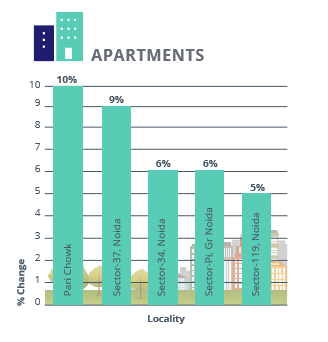 Price saturation, however, has caused rental values to plateau in sectors 41 and 49 in Noida. Ghaziabad posted a rise in the number of enquiries in Apr-Jun 2016 against the quarter ending March 2016. However, the overall bleak market could not bludgeon capital sentiments in certain pockets of Ghaziabad, especially Abhay Khand, Ahinsa Khand II and Mohan Nagar, where values rose to the tune of 2-5 percent Q-o-Q. The real estate markets of Abhay Khand, Ahinsa Khand II, Judges Enclave and Mohan Nagar are benefitting from the metro connectivity. The localities reported a surge in prices despite the fact that the extension of the metro corridor from Noida’s Sector 62 to Indirapuram has hit a hurdle owing to the proposed DelhiMeerut Expressway (DME) project. The broadening of NH-24 is expected to boost sales volume in the realty pockets located across it in the forthcoming quarters. Subsequent to a drop of two percent in the value of builder floors in Jan-Mar 2016, the average rates of this property type plateaued in Apr-Jun 2016. The top grossers – Shalimar Garden and Shalimar Garden Extension I – witnessed capital values increasing by 3-5 percent, each, despite the lack of sound civic infrastructure. Completion of electrification work by the Centre, which includes the establishment of over 20 power substations, in the trans Hindon areas of Vaishali, Shalimar Garden, Vasundhara and others, will impact realty sentiments in the future. Currently, these localities have been experiencing power outages for as long as eight hours a day. Govind Puram, which is situated along the NH-58, witnessed a rise of two percent in property values due to over-ambitious ‘ask’ rates. Contrary to the overall grim realty ambience in Ghaziabad, land values delineated an uptrending graph, increasing by five percent Q-o-Q. 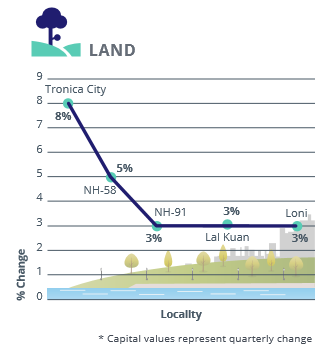 Prices of land parcels in Tronica City recorded a rise of eight percent in Apr-Jun 2016, as compared to Jan-Mar 2016, on the back of infrastructure development. A nine-lane road linking Tronica City to Shastri Park would improve connectivity. The rise of five percent in land values along NH-58 can be attributed to refurbishments in several stretches of the highway. The proposed flyover at Raj Nagar Extension is set to be realigned and the Delhi-Meerut expressway would be strengthened. NH-91 clocked a rise of three percent, owing to renovation work on the Kannauj-Etah and the Aligarh-Kanpur stretches of the highway. Ghaziabad continued losing traction to the neighbouring city of Noida, which offers more attractive housing inventory along with sturdier infrastructure. The rental graph, subsequently, plateaued Y-o-Y. 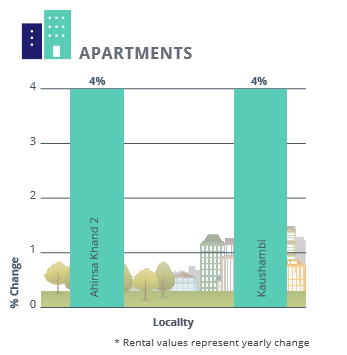 The established locales of Kaushambi and Ahinsa Khand II in Indirapuram emerged as the frontrunners, recording four percent rental growth, each, Y-o-Y. These trans-Hindon localities benefitted from competitive rentals, good connectivity, proximity to the metro station and to the office and commercial hubs of Noida. Oversupply of apartments and high pollution levels have blighted the rental landscape of Raj Nagar Extension, leading to a price stagnation Y-o-Y. The proposed high-speed train-connectivity network might have a positive impact on the landscape, when completed. Limited supply of fresh inventory has also hurt Ghaziabad’s rental landscape. 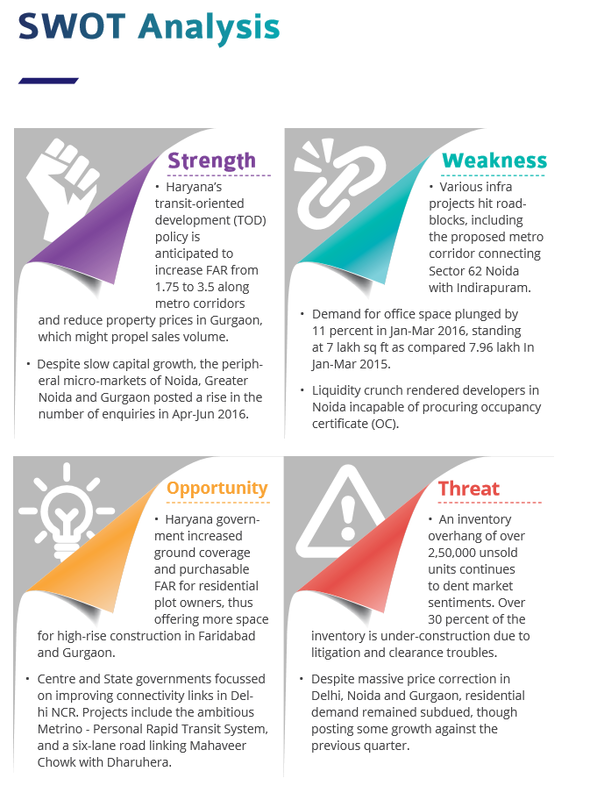 Several government initiatives and infrastructure development failed to turn Gurgaon’s realty fortunes, keeping weighted property prices under pressure despite an increase in the number of enquiries. Only 20 percent of the tracked localities in the Millennium City reported growth on the capital charts. 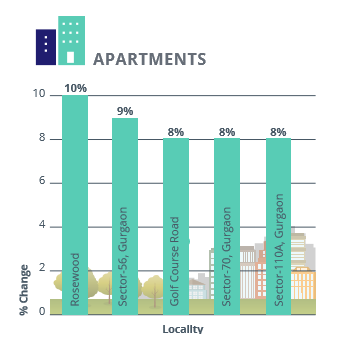 Gurgaon is currently witnessing good traction in the affordable and mid-income housing segments. Therefore, it was not surprising to see the New Gurgaon pocket of Sector 95 becoming the frontrunner, posting a growth of four percent Q-o-Q. Apartments in the locale carried an average price tag of Rs 4,200 per sq ft.
Sectors 37C, 99 and 103, too, witnessed a rise of two percent in capital values owing to the comparatively affordable inventory. The promise of improved connectivity resulting from the numerous road strengthening endeavours undertaken by the government, such as connection with Golf Course Extension Road and widening of the link road, have augmented sentiments on the GurgaonFaridabad Road, where apartment values surged by three percent Q-o-Q. Faridabad, Bhiwadi and Dharuhera, reported a plateauing capital market. However, the potential of improved connectivity via metro has crafted Faridabad’s image as a good investment zone. Sector 43 topped the capital charts, posting a quarterly growth of 2 percent. Bhiwadi and Dharuhera continued garnering investments from Gurgaon and Manesar. 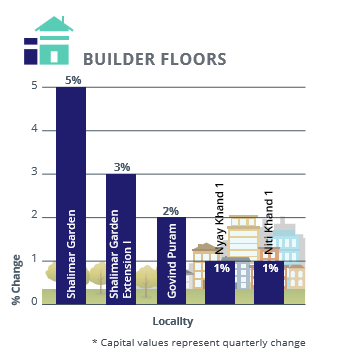 Builder floors posted a two percent decline in average capital values in Apr-Jun 2016, as opposed to the previous quarter. 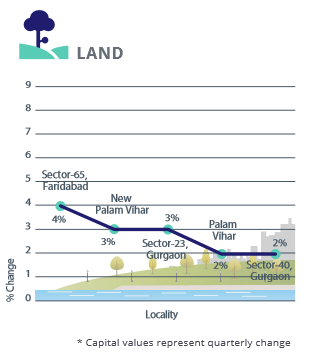 Barring three localities – Ardee City, South City 1 and 2 – where values strengthened by 1-3 percent Q-o-Q, all other localities in Gurgaon posted a receding capital graph. This could be due to the growing popularity of society apartments over builder floors. Builder floors constituted over 25 percent of Faridabad’s real estate market. Average capital values, here, posted a marginal dip of a percent Q-o-Q. With the exception of sectors 16 and 81 in Faridabad, where prices rose by 2-4 percent, each, Q-o-Q, the tracked localities recorded either a stagnant or declining capital market. Replicating last quarter’s trend, average land values plateaued in Gurgaon, although 60 percent of the tracked localities posted a quarterly rise in ‘ask’ rate. Regularisation of colonies in New Palam Vihar, ensuring easy supply of basic civic amenities such as drinking water and sewerage, helped the pocket earn a capital appreciation of three percent Q-o-Q. The average price of land parcels in Faridabad posted no change in Apr-Jun 2016, after plummeting by six percent in Jan-Mar 2016. Sectors 64 and 65 in Faridabad recorded 2-4 percent capital movement Q-o-Q. FNG expressway and metro extension could be the reasons behind the rise in ‘ask’ rates. Infusing some cheer into the otherwise bleak real estate scenario of Delhi NCR, Gurgaon’s rental market posted an annual rise of three percent in Apr-Jun 2016 against the same quarter last year, after descending by two percent in Jan-Mar 2016. A 40 percent increase in office space absorption in H1 2016 in Delhi NCR heralded good news for the Millennium City. 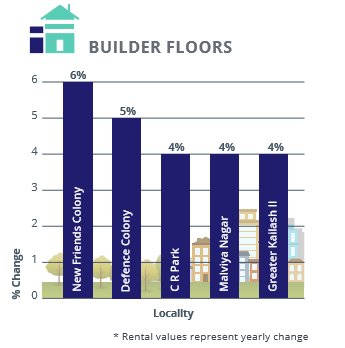 Unlike the fragmented residential market, the commercial and office arena exhibited steady investment, thus, translating into a spike in demand for rental properties. While the posh address of Rosewood witnessed a surge of 10 percent Y-o-Y, rents in Sector 56 swelled by nine percent as a result of the upcoming metro link from Sikanderpur. Builder floors surpassed society apartments to clock a five percent rise in rental rates Y-o-Y. 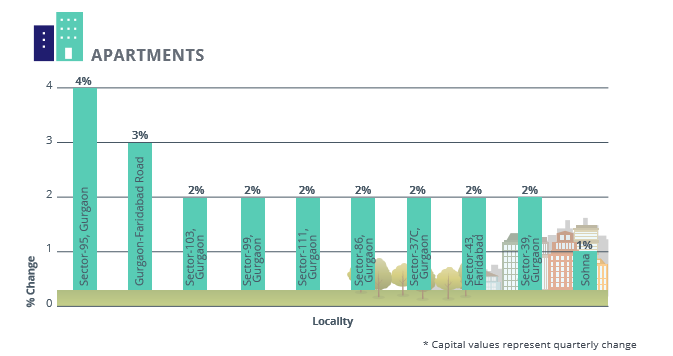 Sectors 23, 52 and DLF City Phase III led the race in Gurgaon with a rental jump of 12 percent, 13 percent and 11 percent, respectively, in Apr-Jun 2016, as compared to the same quarter in 2015. The promise of improved connectivity via metro and proximity to workplaces propelled rental demand in these housing belts. Demand for builder floors reduced in Faridabad, with the rental graph declining by six percent Y-o-Y. With limited availability of builder floors, Bhiwadi and Dharuhera noticed no movement in the rental yield graph of this property type in the last one year. The lingering torpidity in Delhi NCR’s real estate landscape has continued to keep buyers at bay. Despite a quarterly increase in sales volume, existing unsold stock, legal hurdles and inordinate delays downsized sentiments, thereby translating into disparity in the demand-supply equation across zones. Residential apartments continued to dominate the market, being the highest supplied property type in Delhi NCR. However, the demand-supply gap in this format persisted despite apartments capturing 60 percent of the total market share. The Millennium City of Gurgaon alone captured around one-third of the total supply of residential apartments in Delhi NCR, followed by Noida and Greater Noida, each of which netted 20 percent and 10 percent of the property type, respectively. In what seemed like a glaring incongruity, demand for independent houses/villas was exactly double its supply. Delhi NCR witnessed slight disparities in demand and supply of various budget categories in Apr-Jun 2016. While demand for mid-income housing (Rs 40-60 lakh) was inadequately met in the city, high-income housing category (Rs 60 lakh-Rs 1 crore) exhibited oversupply, with Faridabad leading the race in this respect. Gurgaon and Delhi witnessed a significant shortfall in supply of properties in the high income bracket, that is, between Rs 60 lakh and Rs 1 crore. Delhi recorded an oversupply in the ultra-luxury budget bracket (Rs 2 crore and above), creating a state of disequilibrium. The mid-income housing category (Rs 40-60 lakh) was the most preferred in Noida-Greater Noida, followed by Gurgaon. However, supply in both the zones fell short due to maximum new launches focussing on higher ticket prices. The city’s inventory seemed to be inclined towards large sized houses, especially those configured as 3BHK and 4BHK units. While the availability of 3BHK units met market requirements sufficiently, 4BHK units remained oversupplied. Delhi and Gurgaon housed the maximum inventory of 4BHK units. Supply of 3BHK configuration, although matched demand levels in Delhi NCR, witnessed slight disparities on a zonal level. While Faridabad recorded an oversupply, Gurgaon and Noida-Greater Noida saw paucity of the same. Supply of small and mid-sized homes configured as 1BHK and 2BHK units remained inadequate. The areas exhibiting greater shortfall of 1BHK units, with respect to demand, included Delhi and Gurgaon. Ghaziabad, on the other hand, witnessed an oversupply of 1BHK units. In case of 2BHK units, Faridabad, Ghaziabad and Gurgaon recorded an overstock, whereas, Delhi and Noida witnessed a shortfall. 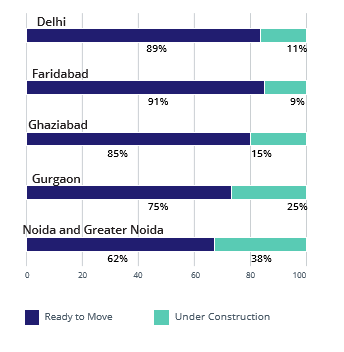 Nine out of ten homebuyers in Delhi NCR prefer ready properties to under-construction homes, due to the inordinate delays in project deliveries. The total availability of ready properties continues to remain insufficient for the city’s appetite. 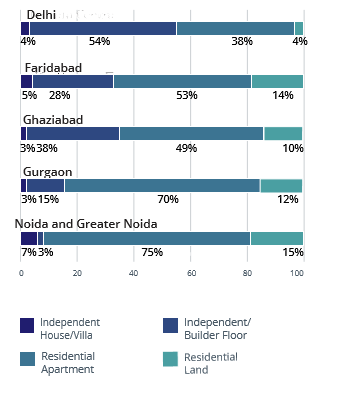 After Delhi, Gurgaon had the largest share of ready-to-move-in homes. The twin cities of Noida and Greater Noida witnessed a healthy demand for ready homes, however, majority of the projects in the zone remained under-construction due to multiple hurdles coming in the way of completion, majority of them related to occupancy certificates. Ironically, Faridabad recorded an oversupply of ready properties, most of which were configured as 2BHK and 3BHK units.